Implants as opposed to bridges for restoring missing teeth: dental implants do not involve any restorative work (grinding) of the adjacent teeth. In case of a bridge, should any portion of the bridge break or fail, the entire bridge construction will have to be redone, adding to an increased cost in the long term and in a worst case scenario a possible loss of the anchoring teeth. Implants as opposed to full or partial dentures: due to the fact that dental implants are inserted into the bone they act like the natural teeth they replace. This allows for the normal functions of speech, chewing and esthetics, as implants and their replacement teeth are fixed dental constructions. As opposed to implants, partial and full dentures are removable devices. Besides the fact that they need to be removed to be cleaned, they are uncomfortable to wear. They transmit the chewing forces on top of the bone through the gum tissue that hurts during chewing. Even this is something you may get used to, the danger is that these kind of forces produce atrophy (loss) of the bone. In time dentures will become unstable, lose their chewing efficiency, and unfortunately due to the bone resorbtion, treatment with dental implants may be very limited or impossible after the patient has worn dentures for an extended amount of time. 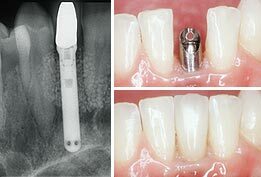 Dental Implants are very expensive! They’re not really, and I will demonstrate. Besides the fact that they’re not more expensive than other less ideal dental treatments that you may consider, implants have a huge success rate of over 98% today. That is due to the extensive amount of technology and research that go into fabricating dental implants combined with a skilful diagnosis and treatment application. Insurance companies don’t cover the cost of dental implants! That is correct. Some insurance companies do cover them, but unfortunately most of them don’t. The reality however is that you will end up paying less (over a period of time ) and avoid more dental treatment in the future. Think maintenance, you preserve the existing bone exactly like a natural tooth and dental implants don’t decay. I already have partial or full dentures so I cannot get dental implants! Not true, such patients are great candidates for implants. You could get implants and retrofit your existing dentures over the implants. That will make a huge difference and give you the support and ability to chew most any kind of food that is a luxury that not all patients wearing dentures have! 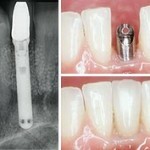 Also for the long term, implant treatment makes more financial sense. I am too old to have dental implants! Truth is that a patient is never too old to have dental implant treatment. With a few exceptions of severe health problems, senior patients can have implants. And is especially for our seniors, that the ability to chew and properly digest more varied and nutritious foods is very important! My doctor told me that there’s no bone to place dental implants! While this is a factor that limits the immediate implant treatment, there are additional procedures, such as bone grafting that will allow dental implant therapy. I’m afraid of pain! Truth is that this is much less painful than an extraction. You’ve probably experienced that pain when you lost your teeth. The discomfort is very easy to manage with pain medication, which is something we prescribe before and after the surgery for all of our patients. I’m afraid of the procedure and generally speaking of the dentist! We understand that our profession can be anxiety driven for some patients. We can easily overcome this problem with sedation dentistry.